The Tripods first came to my attention a few years ago when I stumbled upon a picture of one of the titular crafts in some sort of memorabilia magazine; one that was full of garage model kits. As I recall, I had no idea that there was some sort of “sequel” to H.G. Wells’ The War of the Worlds, and wondered why I had never heard of it. I was, of course, mistaken as the concept of these three-legged walking crafts is merely inspired by those similar Martian crafts, and have no relation otherwise. The Tripods was actually a series of “young adult” novels (way before they were a cultural phenomenon) penned by John Christopher in the late 1960’s to the early 1980’s. The series was a success and was eventually adapted into an awesome television show that I’ve seen the first season of. If this sounds fun, be sure to look for my reviews of that show on here. 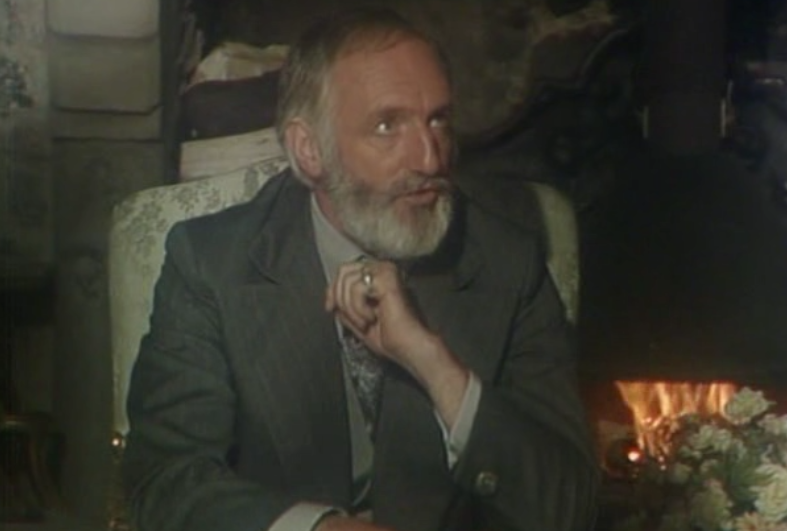 The production was a joint venture between the BBC and the Australian Seven network, and lasted two seasons. Sadly, a third season died before it went into production. The White Mountains is immediately unsettling based solely on the realization that something is wrong. The book employs a great juxtaposition of little hints of lost technology and a primitive, medieval-ish, somewhat pastoral, setting. This sets up what I will be calling “The Reverse Shyamalan”- we have already seen the twist, something bad happened and this is a dystopian future – now let’s work backwards and find out why. Maybe it’s more like Memento? I’m sure I can figure out a better early 2000’s film reference to put here, but that’s beside the point. Anyway…we know that something isn’t right: either these people are some sort of Anabaptist off-shoot that hates technology, or something bad has happened in the past. This is answered almost immediately as we meet the main characters on their way to a village celebration. It seems that Jack, a neighborhood boy, has reached the age at which everyone is considered an adult, and is to have his “capping ceremony”. 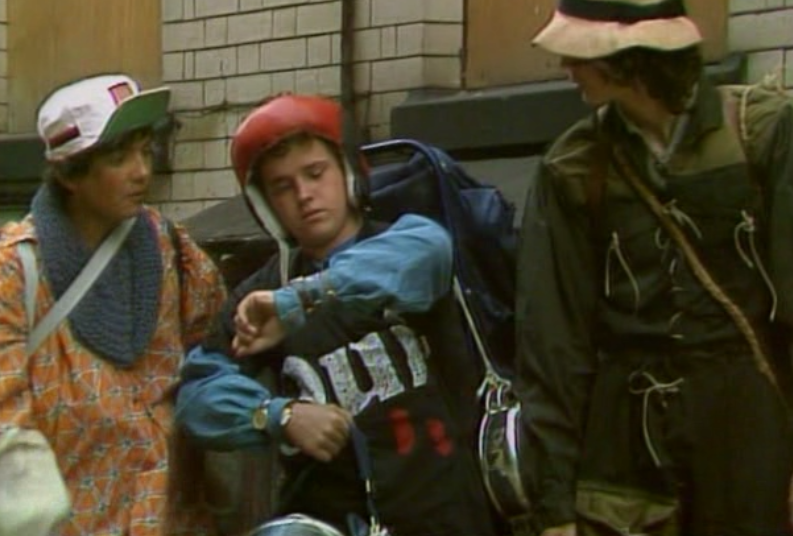 Will (and later his cousin Henry) are disturbed by this practice as everyone that gets “capped” comes back different. Capped individuals seem to lose any sort of creativity, drive, and imagination that made them who they were. “Adults” become bland worker drones that want no other past time than work and sing the praise of their “masters”. 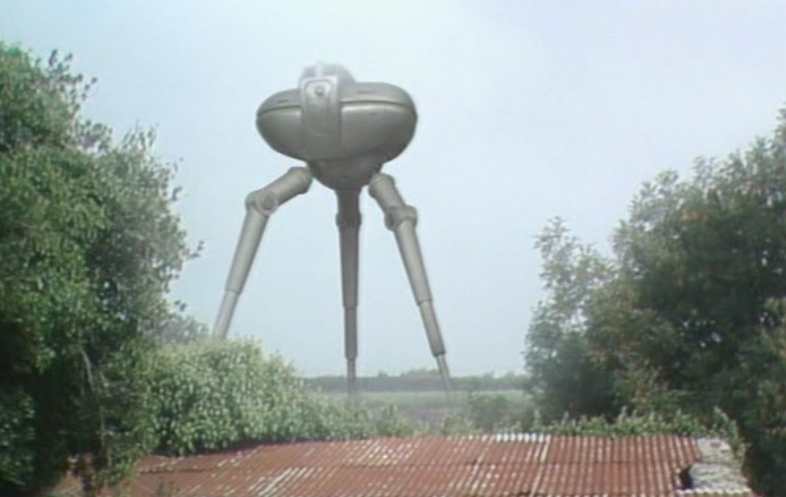 These masters are of course gigantic three legged monstrosities called “Tripods” and the Capping Ceremony can be surmised as a way of them controlling humans. At this point we have no idea what these creatures are or what they want with the human race, but one can see that it isn’t good. 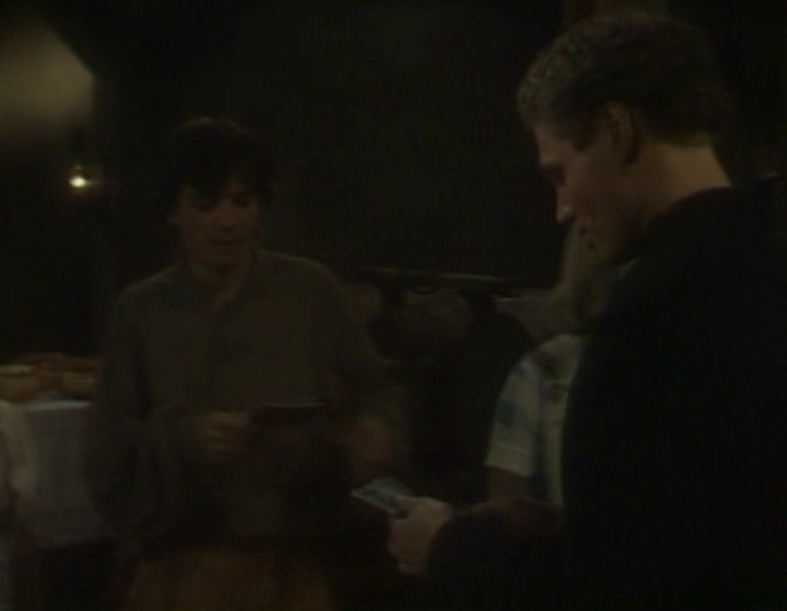 Will strikes up a conversation with an eccentric “vagrant” named Ozymandias that talks of a land of free men in the White Mountains, a land outside of the influence of the Tripods. 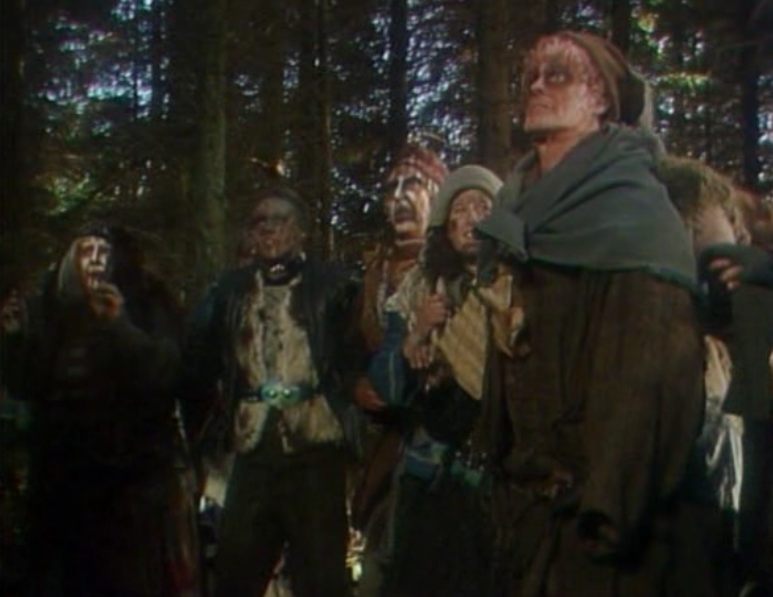 Vagrants are those that are seen as harmless by the Tripods and regular capped townspeople, but are not allowed to mingle with everyone else. Usually it is accepted that these people were “driven mad” by the capping process and are better to be not spoken about. 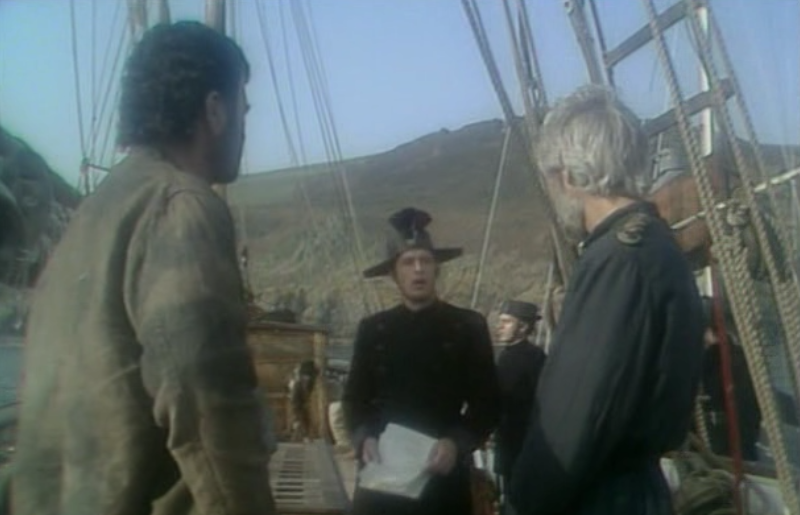 Will is amazed by what Ozymandias has to say, and plans to escape to the European mainland to find this utopia of freedom. Then a whole lot of shenanigans ensue – a third character named Beanpole joins up, and grenades get hurled at stuff. I will let you read to find out the rest. I was struck with how different this book is to the television series. First and foremost – Will and Henry almost hate each other. Even coming to blows a few times. 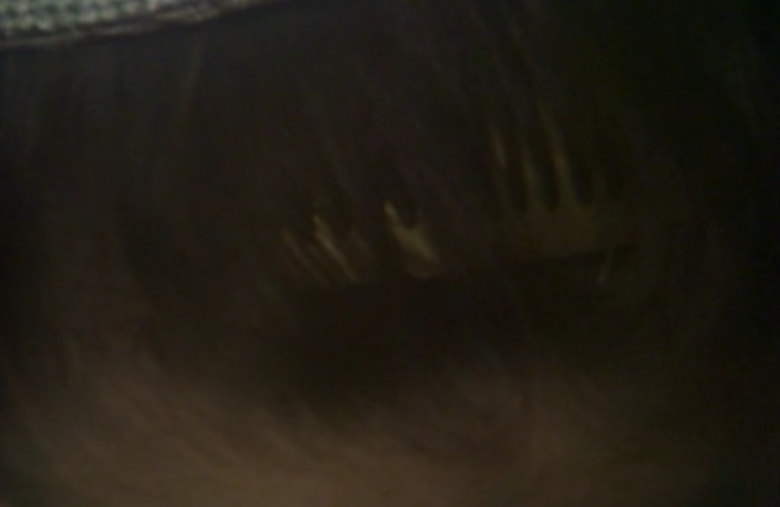 The show also has a LOT of “fluff” padding the main part of the story. Honestly, the book flows better and is very tightly paced. This is ostensibly a young adult book or some equivalent thereof and can be read very quickly, if you enjoy science fiction I would greatly recommend it. Many medical professionals go to school for upwards of eight to ten years to hone their craft as a practicing physician. Intricate procedures like doing surgery are skills that one must spend countless hours to perfect in order to keep the patients alive and well. 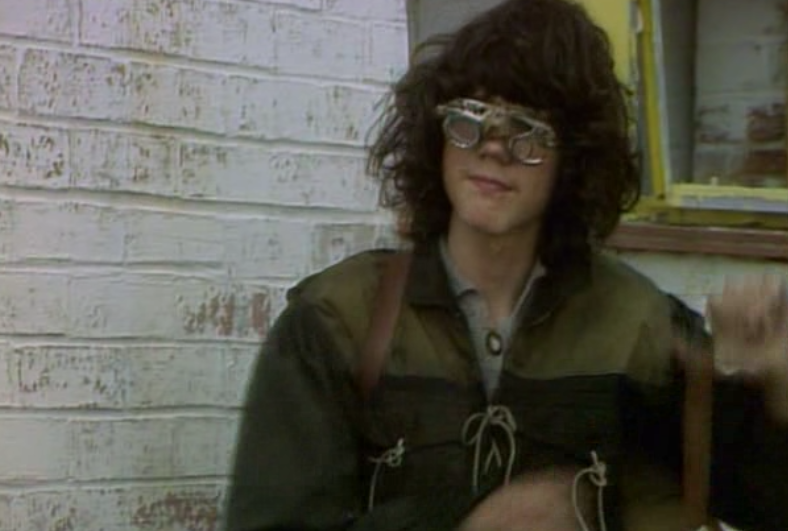 In a post-apocalyptic dystopia nobody is that lucky, and your only bet might be the gangly guy with glasses who seems smarter than everyone else. 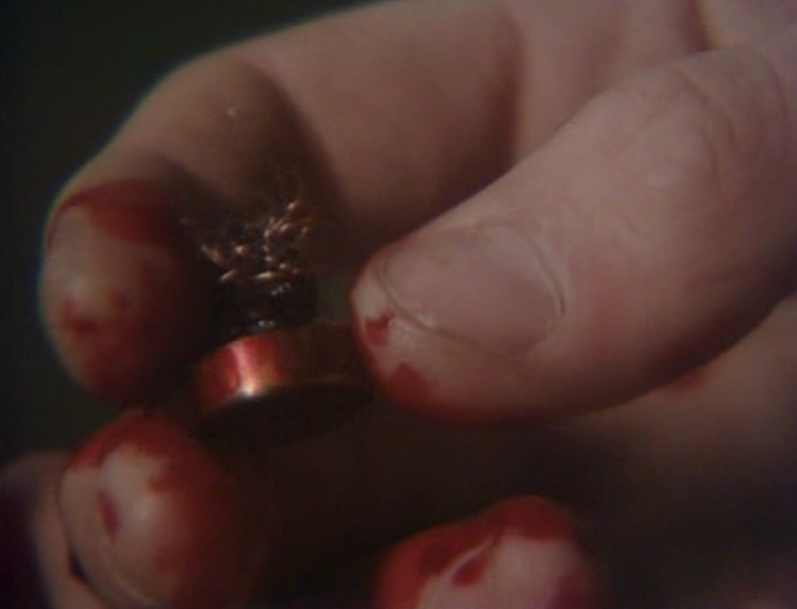 When faced with a foreign object embedded into his flesh, Will has to make that very choice – letting Beanpole dig a hunting knife into his side to remove what can only be assumed to be a Tripod tracking device. To really send the gravity of the situation home, one of the last things beanpole says to Will is- “you better find something to bite on.” This is, of course, as he sharpens his knife on the wall of a dirty underpass they are hiding in. Once again Will becomes a bit of a liability to the group as he recovers from his amateur surgery. Not since a handful of episodes ago has the team been so vulnerable to an attack with Tripods basically crawling all over them. Beanpole steps up and formulates a plan involving this tracking device, their new horse, and a straw dummy fashioned to look vaguely human. 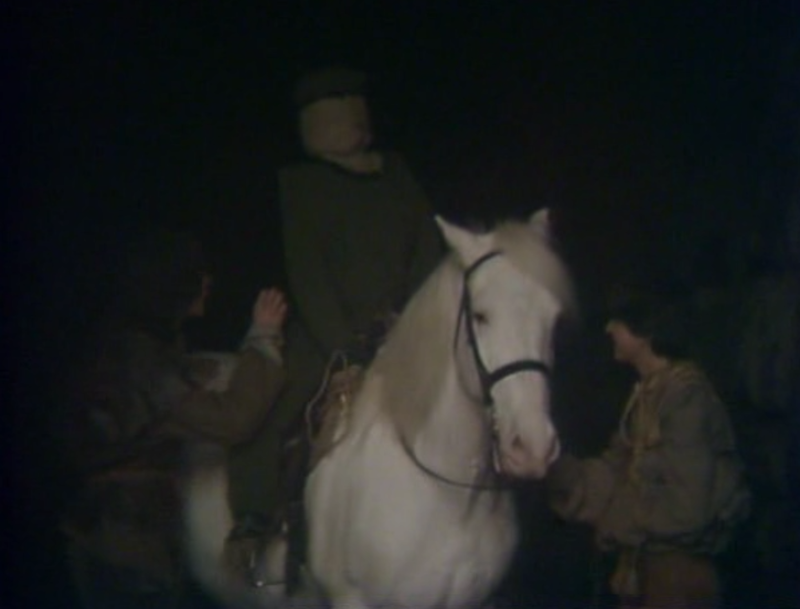 The tracking device is stuck in the dummy, the dummy placed on the horse, and the whole shebang is sent off into the wilderness or as far away from the boys as they can get it. One of the many things I like about the characterization of Beanpole is that he is a formidable genius, but it’s not too over-the-top. Some shows have guys in these sorts of survivalist situations that rub two pine cones together and produce cold fusion somehow or another. Characters like McGyver come to mind, and even though I loved that show as a kid, his genius was a little far-fetched at times. 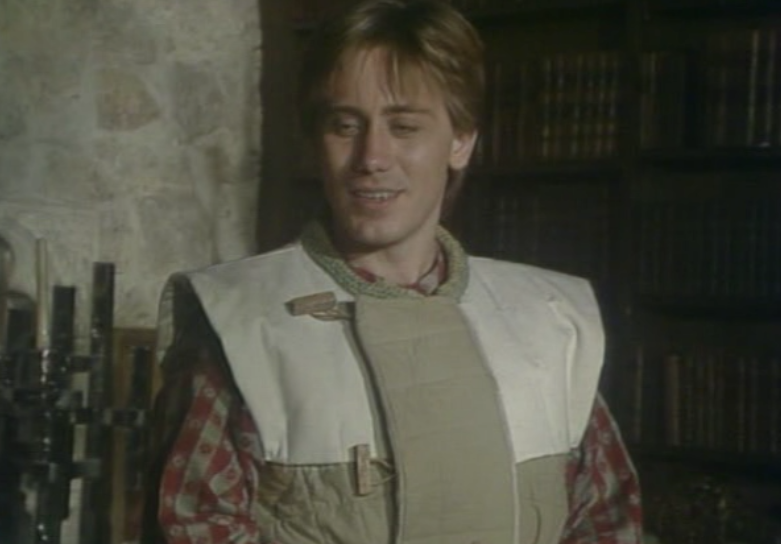 Beanpole is more realistic in the way that he attacks the trios problems, and whether it be cutting into somebody to retrieve a weapon or creating a dummy to distract the baddies – it’s exactly the sort of stuff one could imagine a sheltered genius doing with very little materials. 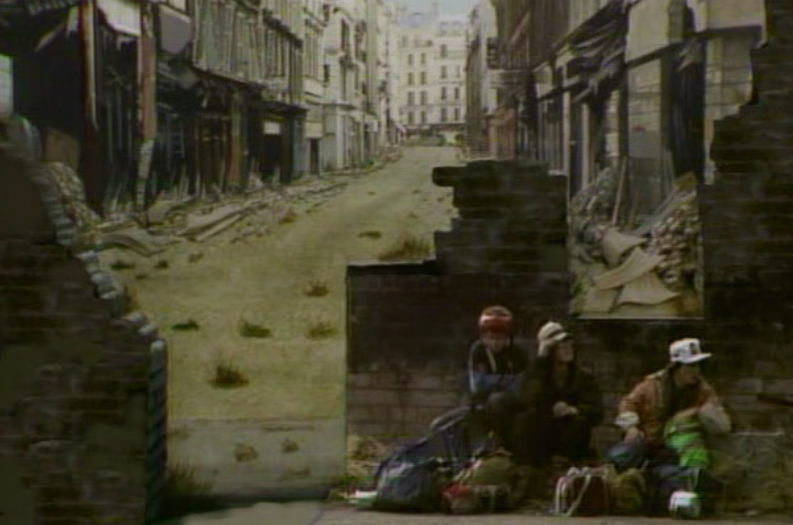 Once this plan is executed, flawlessly I might add, the guys find themselves once again in the company of French citizens with an injured Will needing a place to rest (sound familiar?). 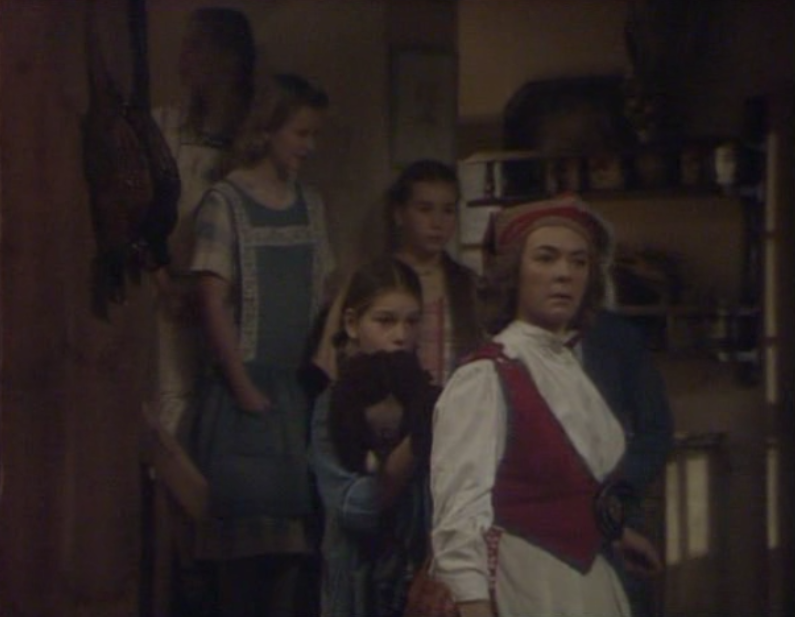 This time they are taken in by a group of young girls and their mother and father, a headmistress of sorts and a farmer. Unlike the previous aristocratic family, these guys run a vineyard and live off of the land. They of course get cleaned up, fed, and are expected to work a little bit in exchange for the hospitality. 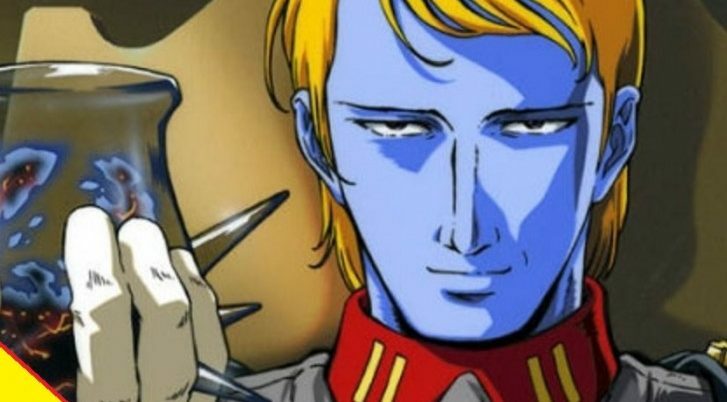 I noticed that this show has a silly way of making French people suddenly all start speaking English, and it first popped up in the “Chateau arc”. Basically when these girls realize that Will and Henry are not French (Beanpole is) they proclaim that “from here on out, we will all be speaking English”. This is from the perspective of hospitality within the show, but it’s real purpose to to keep the whole thing left un-subtitled for English speaking TV audiences. Let’s face it, if this were to really happen Beanpole would be translating for Will and Henry, and everyone else would be speaking French. Drawing attention to such a problem almost makes it more silly than just having everyone magically speak the same language. Basically, this episode and the next episode exist solely to give Henry a romantic fling so that Will isn’t the only “Mac Daddy” of the trio. This entire story-line is absent from the original books, so I’m not too sure if this was added in as a “filler” of sorts or to balance the story out a bit. It becomes fairly clear that this family is keeping the boys around in the hopes that their enormous family of young girls will suddenly all get married and move on. Will is still hurt from what happened to Eloise just days prior, and wants no part of this. Henry however goes on and starts to fall in love with one of the older daughters. Will and Henry basically flip sides on their previous views on relationships during this adventure, and come across as huge hypocrites. Henry suddenly has googly eyes whenever he thinks about staying at the house – to the point that he suggests they wait there all winter. Will, on the other hand, suddenly doesn’t trust anyone and wants to leave ASAP. We don’t see them bicker too long, as their decision is basically made for them later in the episode during a banquet for the oldest daughter. 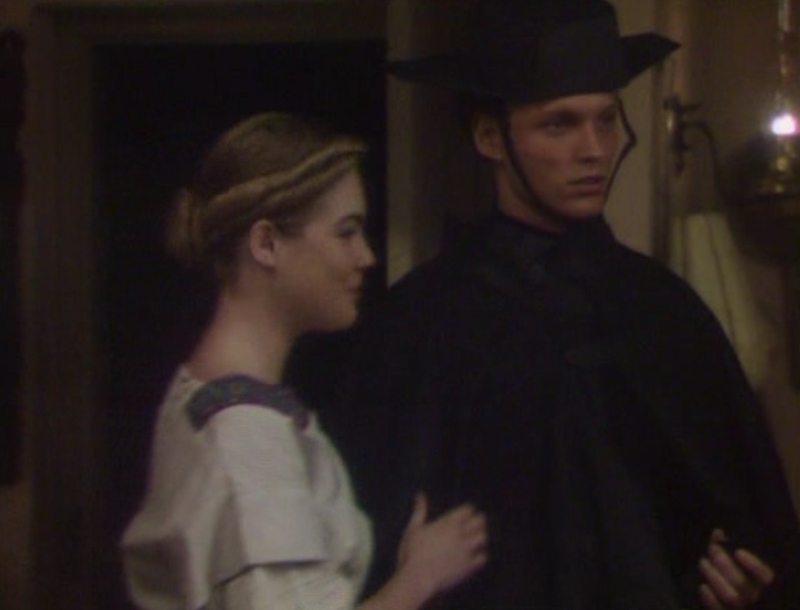 They are all set to meet her fiance, and a young “Blackguard” walks in the door! 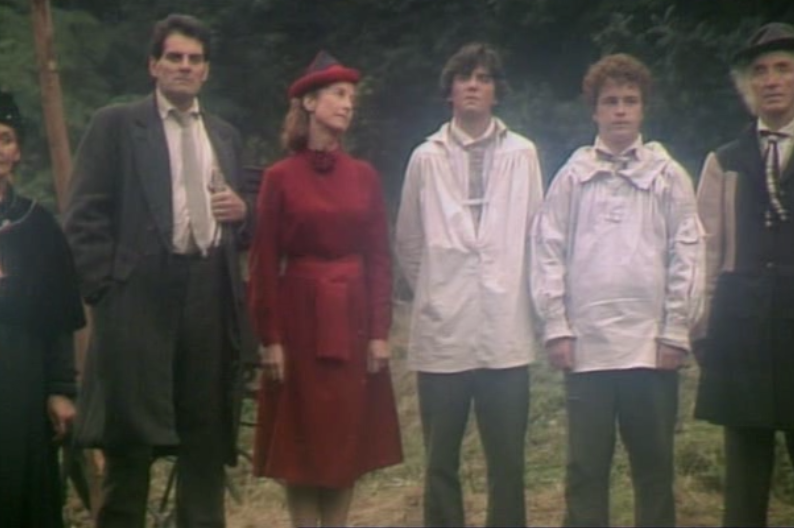 if you forgot who those guys are, just think of Nazi Gestapo officers working for the Tripods. They also have dumb hats! 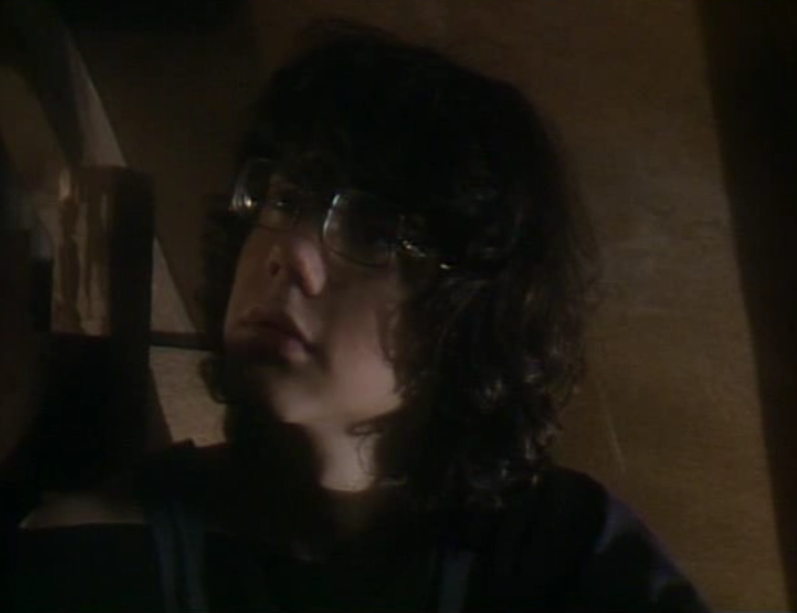 As we roll into episode 10, the boys are on the verge on yet another daring escape, and with Will at less than 100%, that’s not going to be easy at all. Luckily, this story is wrapping up pretty fast and we don’t have 4-5 more episodes of Henry falling in love to deal with, sad that he gets the short end of the stick all the time. This is the ONE sentence that sums up this particular story-arc‘s mini-villain pretty well. 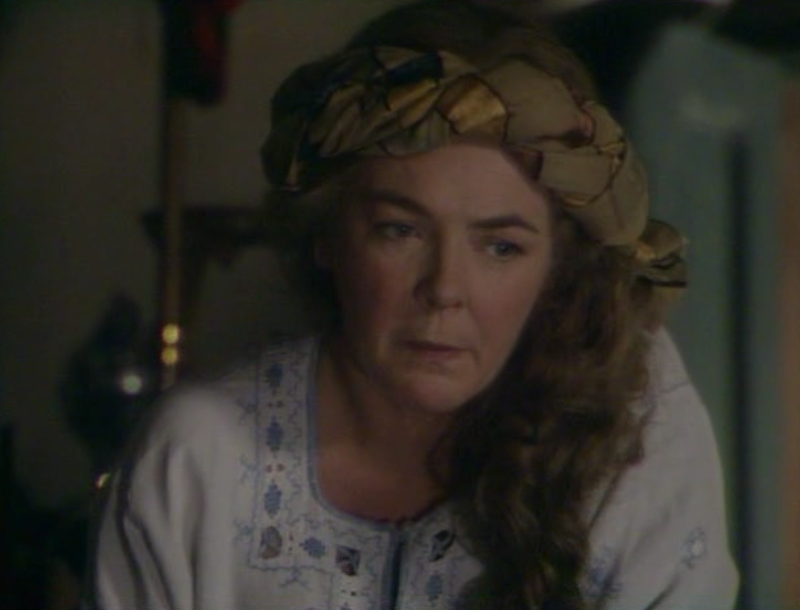 This was, of course, Duc Du Sarlat‘s answer to Will’s simple question of “why Eloise?” pertaining to the previous episode’s climax. For those not following along at home, this general “D-bag” referred to as The Duc Du Sarlat basically cheated in order to win a prestigious athletics tournament, and was given the chance to name his own “Queen of the Tournament”. He, of course, chose the love interest of his rival, his former fiance until Will showed up. This was purely in spite, and generally because he wasn’t getting his way. You may be thinking “I’ve seen this trope a million times before, if she’s got to marry that slime ball, Will should just…” Wait right there…Eloise wasn’t betrothed to Sarlat, no that would be easy, she won a one-way trip to the Tripod home city never to be seen again. This sort of villainy is great, because a lot of genre fiction villains fall into the problem of being “too cool to be bad”and end up being either anti-heroes or reformed villains turned heroes in the end. Unless my assumptions are completely off here, Sarlat is destined for none of that. He seems to be taking a page out the the playbook of other notable fictitious bastards (non-literal) and doing everything in his power to be vile and unlikable. 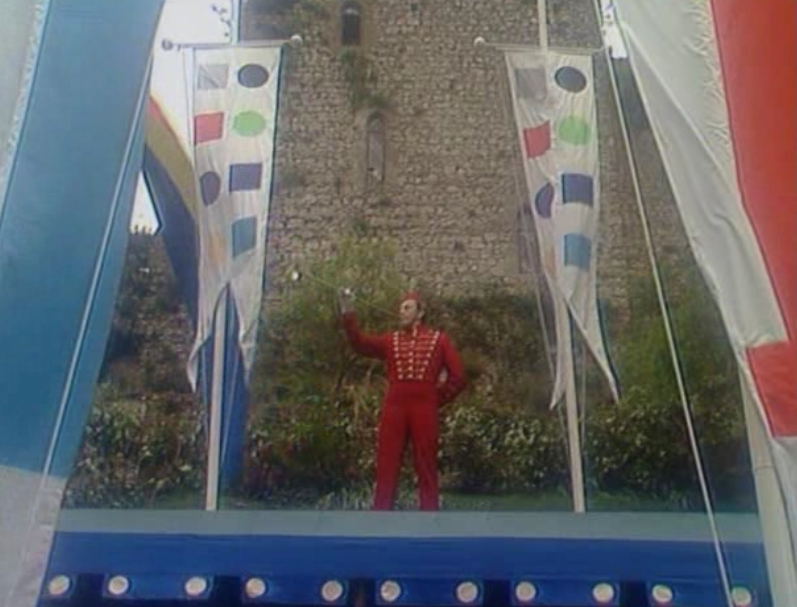 Duc Du Sarlat is your classic literary”resenter” villain, he’s that guy that stands behind the hero and feels bad because the hero of the tale is getting good things, and he’s losing a bit of his prestige. In previous blogs, I’ve generally compared him to a Game of Thrones character named Joffrey, but If I mill over the whole thing, he’s more like Harry Potter’s Draco Malfoy. Not only is he a colossal jerk, but he’s also pretty pathetic and isn’t even cool enough to be a real villain. If he were to get killed, that would almost be too good for him. Will gets tired of his new social pressures sans-Eloise and slips out under cover of nightfall during a fancy banquet. This is really no shock since he was planning an escape anyway, but the way he leaves is sort of depressing. While riding a horse around the French countryside, in an inky cover of darkness, he stumbles onto a lurking Tripod and is taken prisoner by it’s huge metallic tendrils. 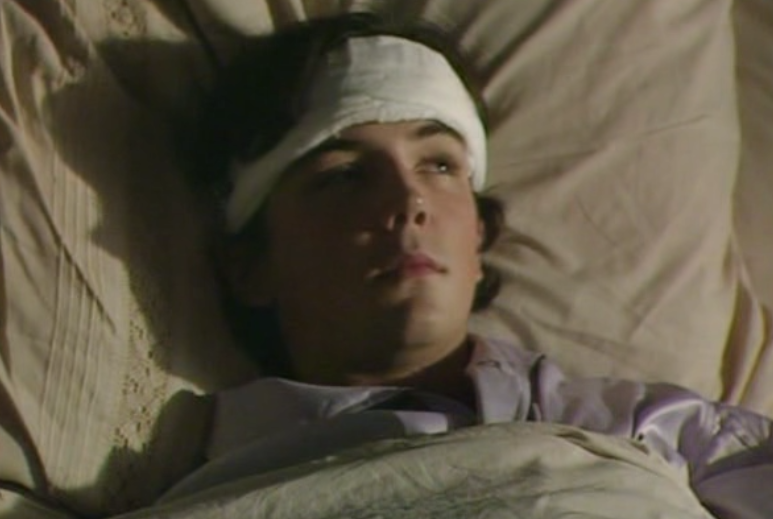 The next morning, Will wakes up as if nothing had happened. He wasn’t capped, and it definitely wasn’t a dream, so he is puzzled why he is so lucky. 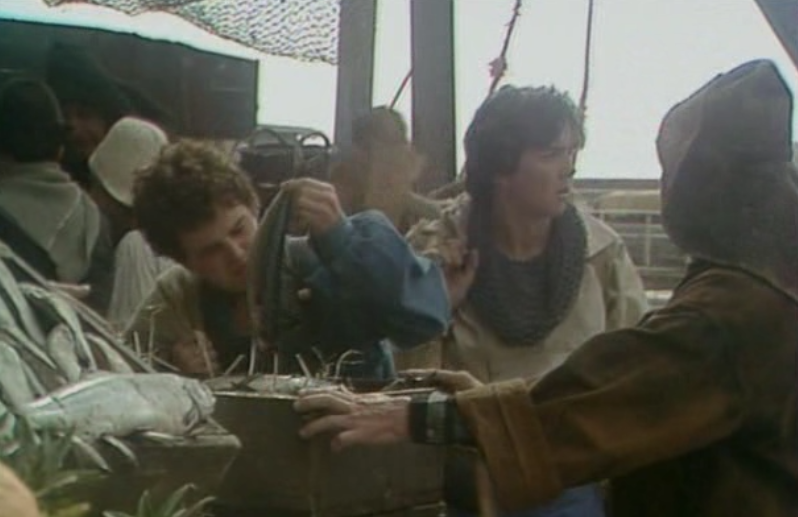 After meeting back up with Henry and Beanpole it all becomes clear – the Tripods have planted a tracking beacon into his skin like a wildlife conservationist would do to a fish. 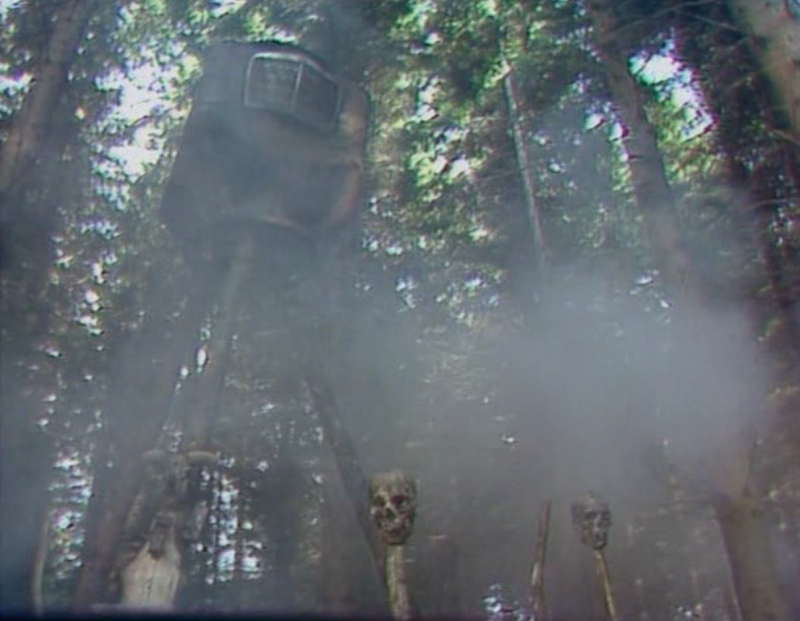 Not only are they following the boys, the tripods seem to be using them to gather Intel on other like-minded people. 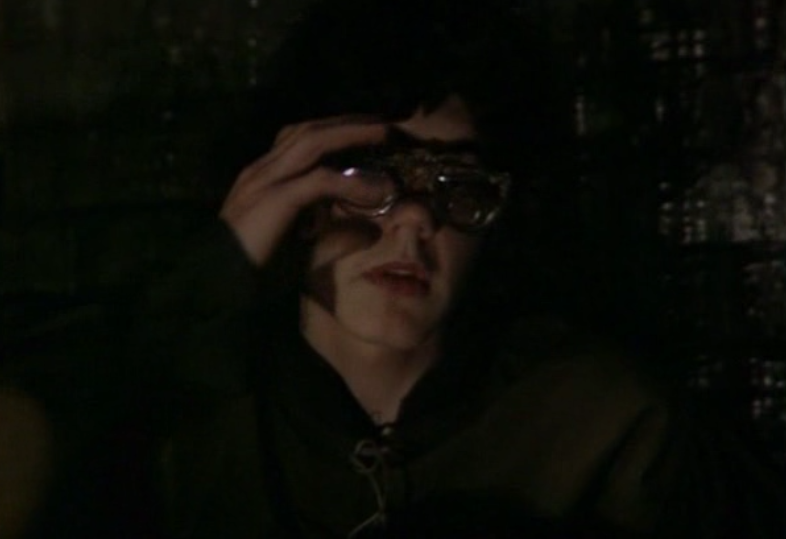 One quibble I had with this episode was that more than a few of the exterior scenes were nearly pitch black. I sometimes get privately annoyed when movies and TV shows film “night-time scenes” in broad daylight then lay a cheesy “oh look how dark it is!” filter over the whole thing. It usually looks like the movie is being filmed with sunglasses over the camera. 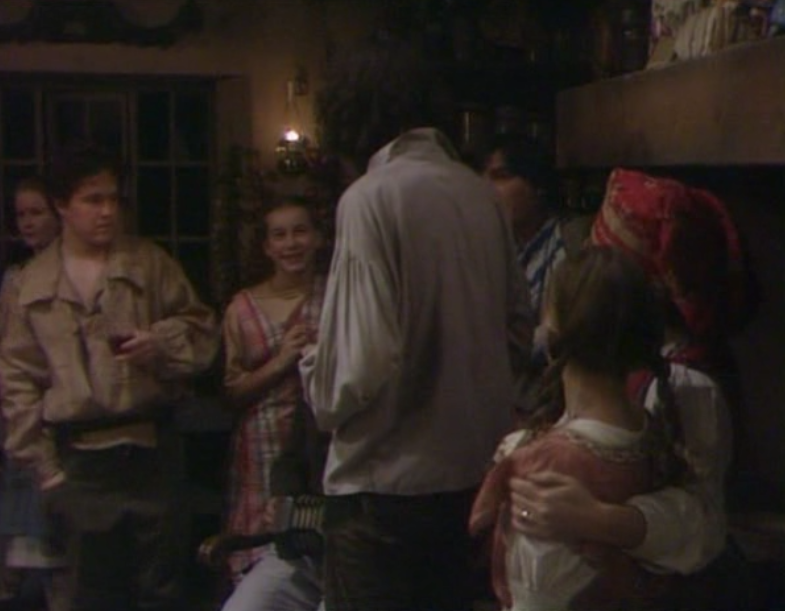 Here we see why they do that, as many scenes during Will’s escape are almost entirely pitch black. 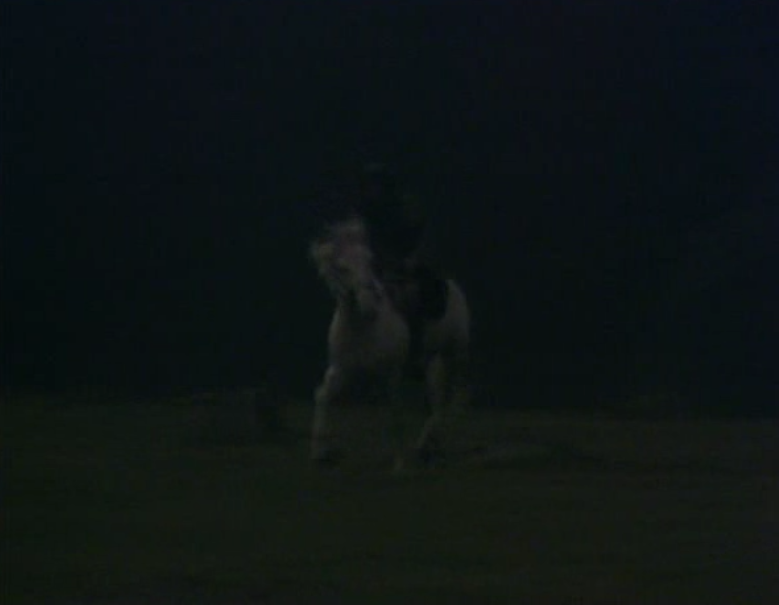 If it wasn’t for the fact that he’s riding a white horse, I’d think that my TV suddenly stopped working. 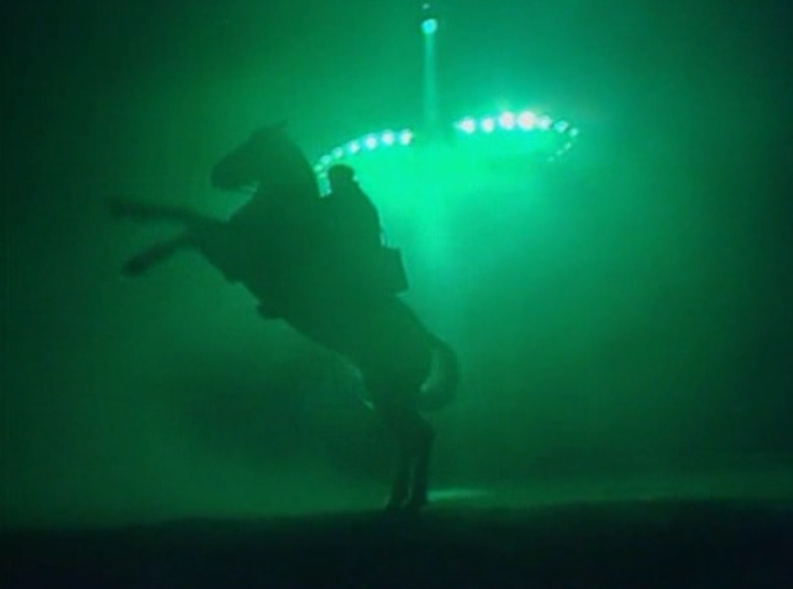 These scenes do work in that once will almost rides his horse into a Tripod, it’s lights cast an creepy green tinge to everything that gives an other-worldly feel. 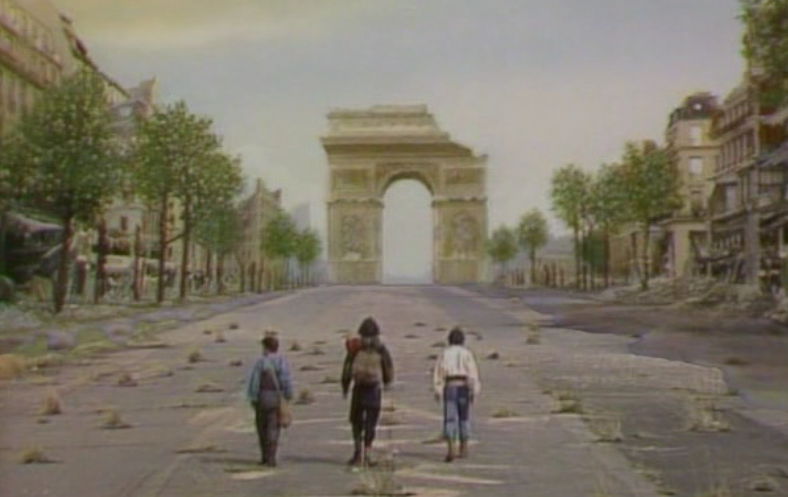 One of the recurring themes of this show is the loss of civilization due to The Tripods, and our heroes coming to terms with a past that is so distant to them that they are completely ignorant to it. We saw a bit of this is a previous episode involving the boys walking through a Parisian shopping mall and nearly getting themselves killed with various weapons like guns and grenades. 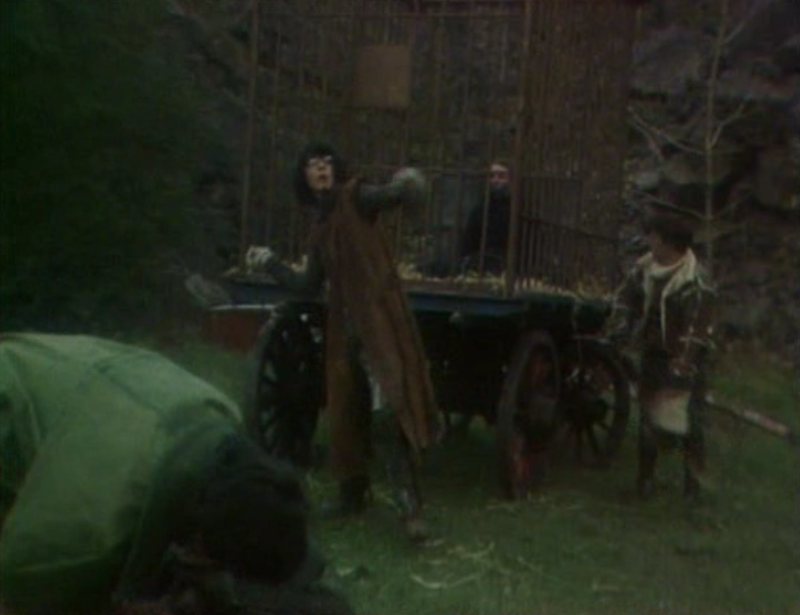 This time we see them come face to face with a marauding Tripod trying to corner them in a small shack that the boys are using as a safe house. Henry has a great idea: starting a fire will cause smoke to surround them, and they should be able to escape through said smoke. Next thing you know, the boys have started a huge fire and are chucking all the wood they can find onto it. The camera pans over the back wall to reveal a HUGE stockpile of various petroleum-based fuels such as gasoline and kerosene! This is where they innocently discover an easy way to get a Tripod off their backs – an explosion! 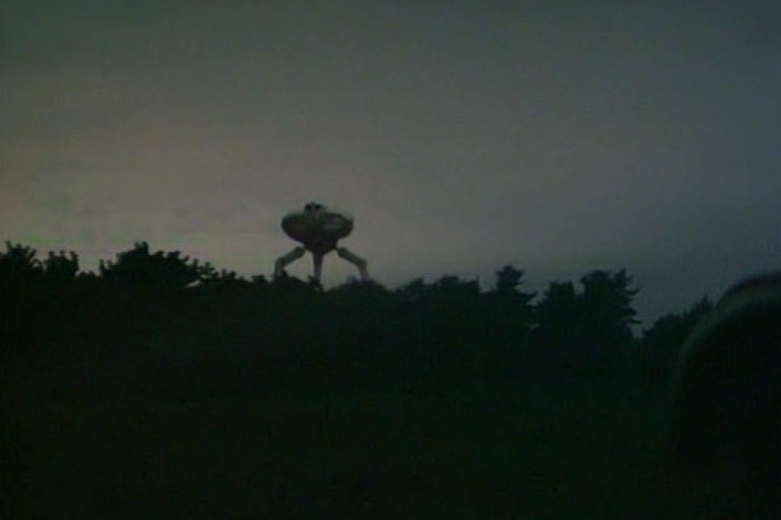 With that out of the way, this episode is the first that really starts to look into the nature of the Tripods themselves. 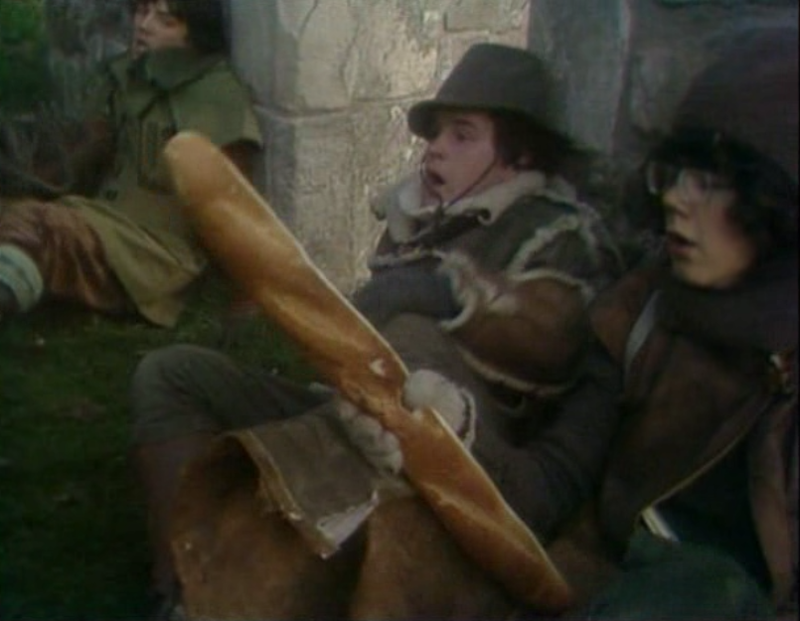 The boys ponder if it’s a huge creature or if it’s merely a vessel by which something drives around the countryside. It’s still a while before we get the answer, but at least Will and the gang are starting to discover what they can do to defend themselves against this monstrous walkers, even if it takes the might of a while storeroom of gasoline to do the trick. 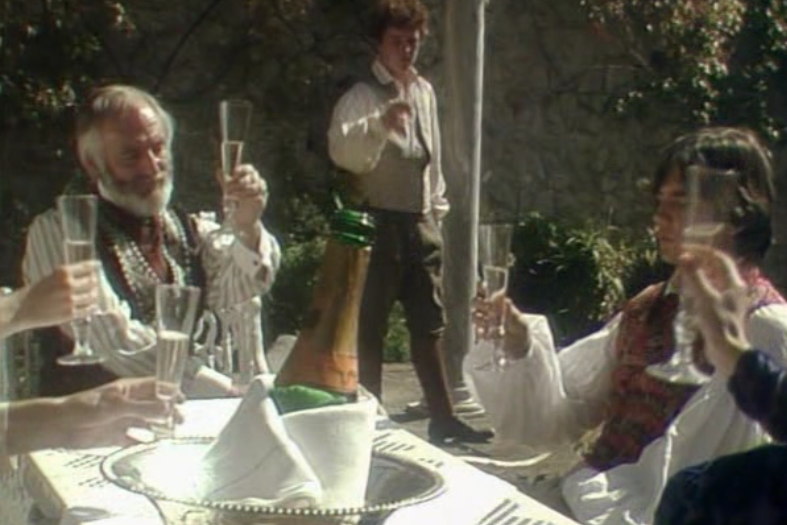 All in all, this was a solid episode, and a great injection of much needed action piped into the show after the characters were running around a stuffy chateau for the better part of four episodes. Now Will has nothing to distract him from the goal of reaching the White Mountains as fast as they can, and barring more Tripods, nothing can stop them. When we last left Will and Henry, the boys were disgusted by a “capping ceremony” for a former friend named Jack. At a certain age, all boys are expected to give up frivolous things like creativity and adventure and submit to the life that the ominous Tripods have set out for them. This usually includes working in a hard labor camp, mine, factory or even helping the Tripods directly. 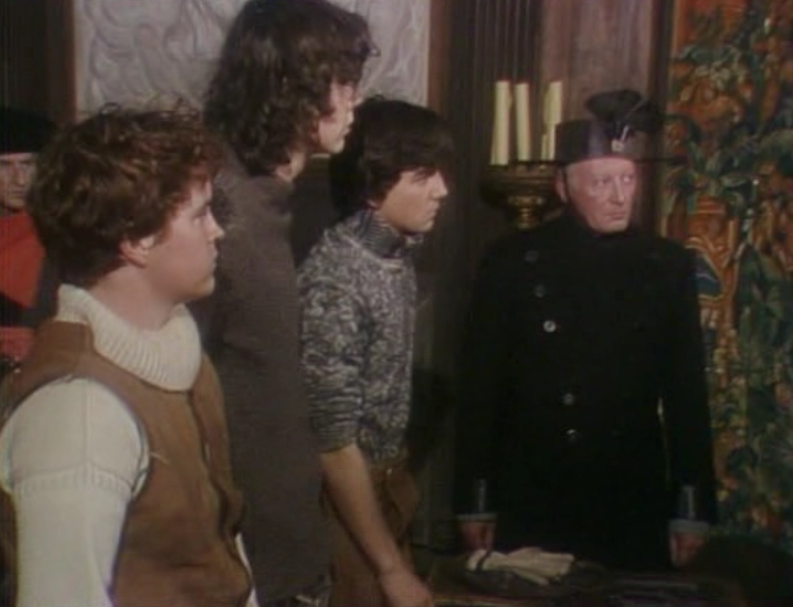 The boys leave a goodbye note to their family and rush out to meet with Ozymandias, a supposed Vagrant they just met. 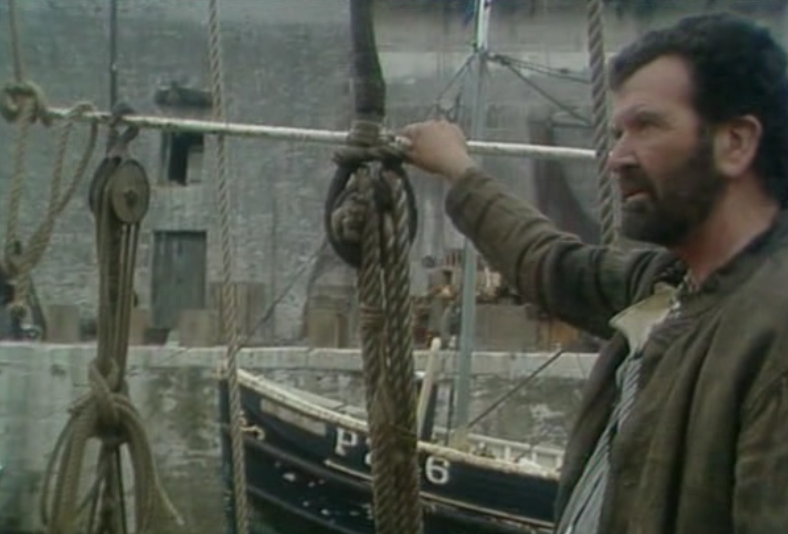 He tells them of a path to a port city and a way to the European mainland. 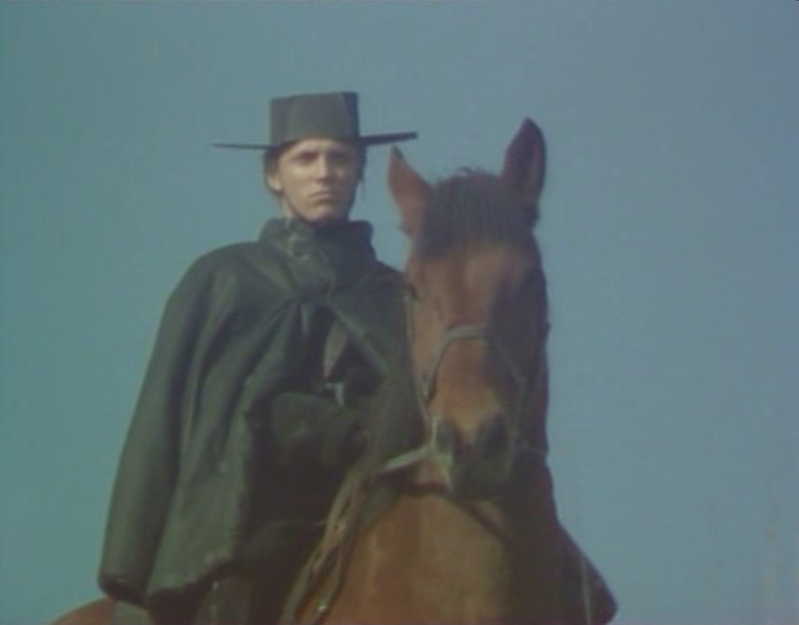 A man named Captain Curtis is known to freely transport runaways on their quest to the White Mountains, and is said to be just like Ozymandias in that he also has a false cap and can think for himself. 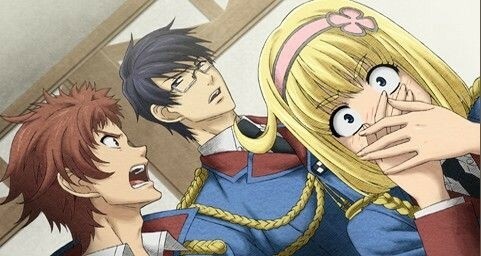 Needless to say, things don’t go as planned and Captain Curtis isn’t the nice guy that they thought he’d be. He’s not evil or anything, he just doesn’t like the fact that two snot-nosed kids are on his ship expecting him to give them money and such. I mentioned the nature of the Vagrants a bit in my last review, but did not elaborate on what makes Ozymandias stand out in comparison. In the books by John Christopher, it is revealed that “cappings” don’t always go well. This can be expected, seeing as they are placing a brain washing device directly on a person’s skull. Roughly five percent of people that get capped are driven insane, becoming Vagrants. The Tripods can even make someone into a Vagrant on purpose if it fits their needs in dealing with a potential “problem person.” Vagrants range in intellect and self-sustainability, but usually lie somewhere between a really disturbed person unable to care for themselves and on lesser cases, a medieval village idiot. Ozymandias is nothing like this; the man is well spoken, seems to have all his mental faculties in place, and knows how to think for himself. He claims to have a false cap on his scalp, a precaution to fool everyone into thinking he’s just as idiotic as the other Vagrants. Running off with the man, seems like a terribly stupid idea to the boys, but they know it could be their last chance to avoid being capped, and to live free. I really love the theme of this show, as it is basically in a similar vein to other works that espouse a need to think for one’s self and reject norms that society puts in place. On an innocent level, The Tripods can be compared to Peter Pan, as bot Will and Henry are definitely resisting “growing up” in order to live free and have adventure in their lives. One can see that this whole set up is a reaction to what happens to most people when they move into adulthood. We all give up dreams of being astronauts and princesses, and submit to 9 to 5 jobs that many of us don’t enjoy. While I don’t think many have a fifty foot tall monster as a supervisor, the allusion still stands. Like the first episode, the second is mostly more dialog and set-up, but has a tad more action as a whole. 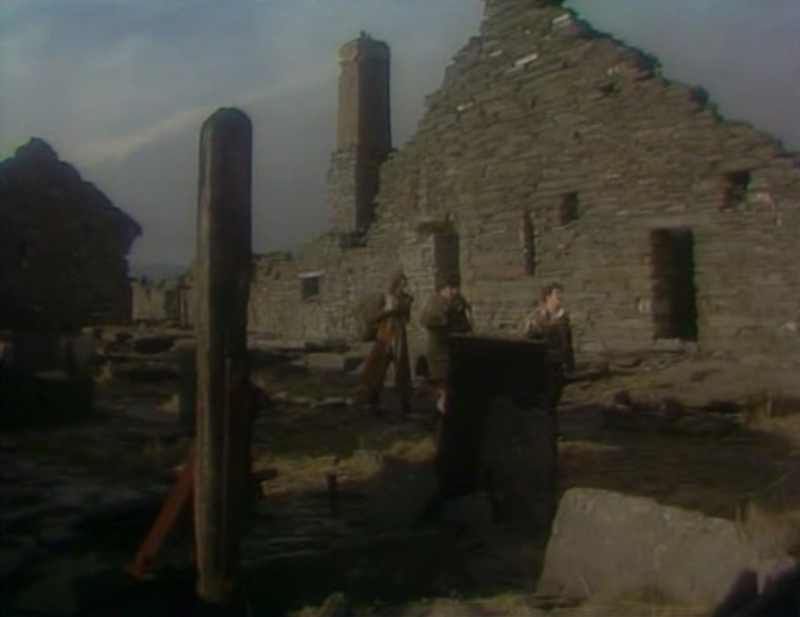 As the boys leave the village, they are embarking on a Tolkien-esque quest in no-mans-land; and just like a group of weary Hobbits, our boys have no experience dealing with the outside world. With search parties looking for them and Ozymandias getting severely injured, things start to unravel. Ozymandias laid out a “easy” quest for them, one that almost immediately goes wrong as they are seemingly “shanghaied” onto the wrong boat. This of course is just the first in many problems that plague these guys. 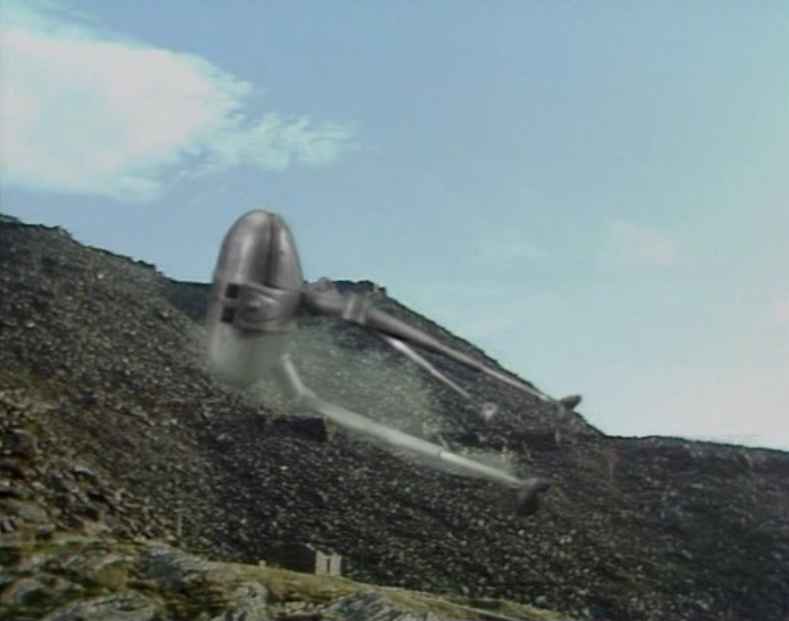 Once again The Tripods Delivers awesome sci-fi action that keeps you on the edge of your seat, and makes you wanting more due to the cliffhanger endings, a similar trope used in Doctor Who to great effect. The Tripods first came to my attention a few years ago when I stumbled upon a picture of one of the titular crafts in some sort of memorabilia magazine full of garage model kits. As I recall, I had no idea that there was some sort of “sequel” to H.G. 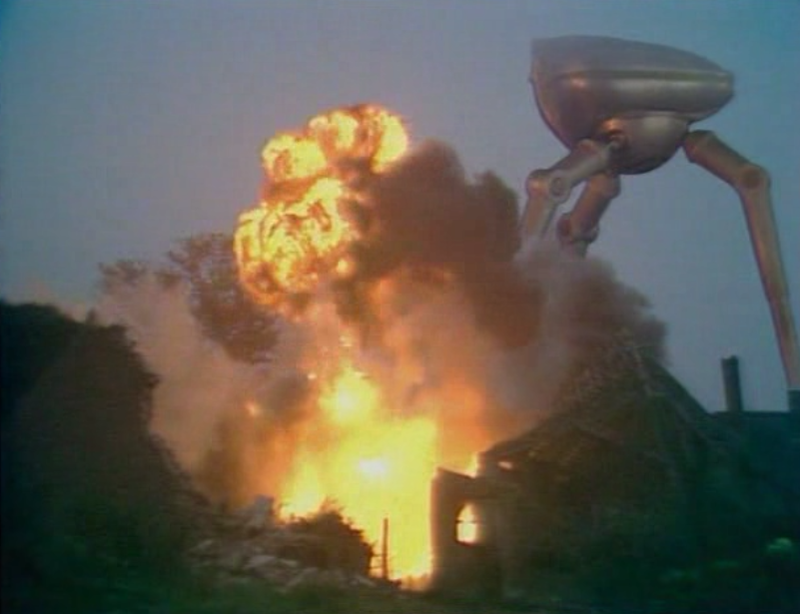 Wells’ The War of the Worlds, and wondered why I had never heard of it. I was, of course, mistaken as the concept of these three-legged walking crafts is merely inspired by those similar Martian crafts, and have no relation otherwise. The Tripods was actually a series of “young reader” novels penned by John Christopher in the late 1960’s to the early 1980’s. 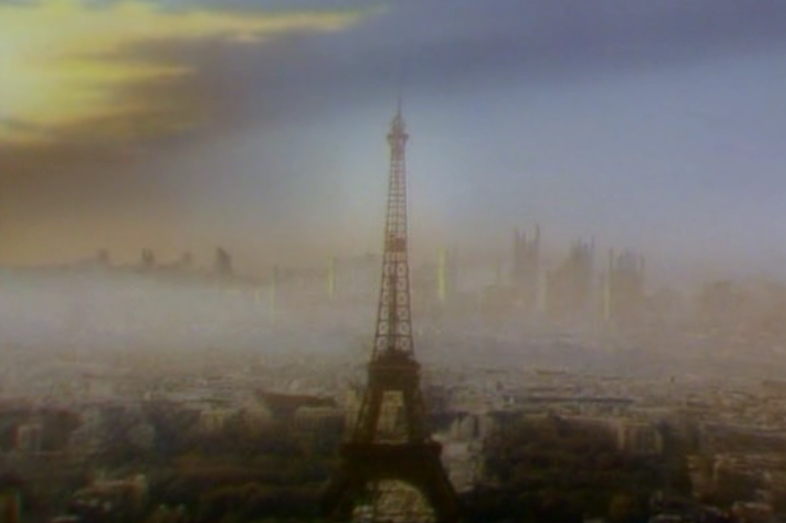 The series was a success and was eventually adapted into the very television show that we’re talking about today. 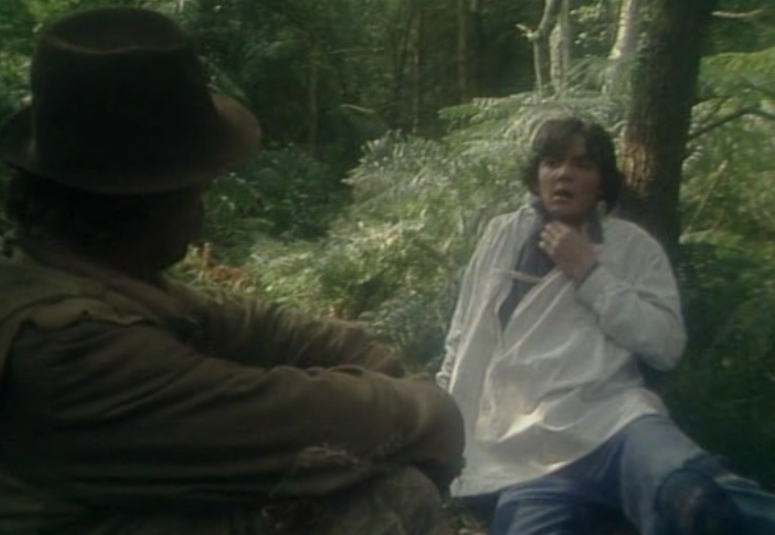 The production was a joint venture between the BBC and the Australian Seven network, and lasted two seasons. Sadly a third season died before it went into production. 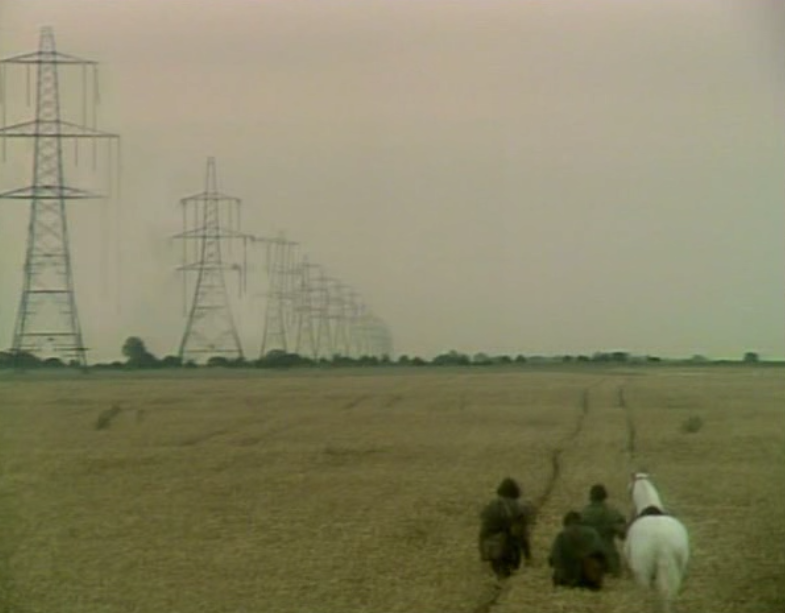 The Tripods is immediately unsettling based solely on the setting alone. 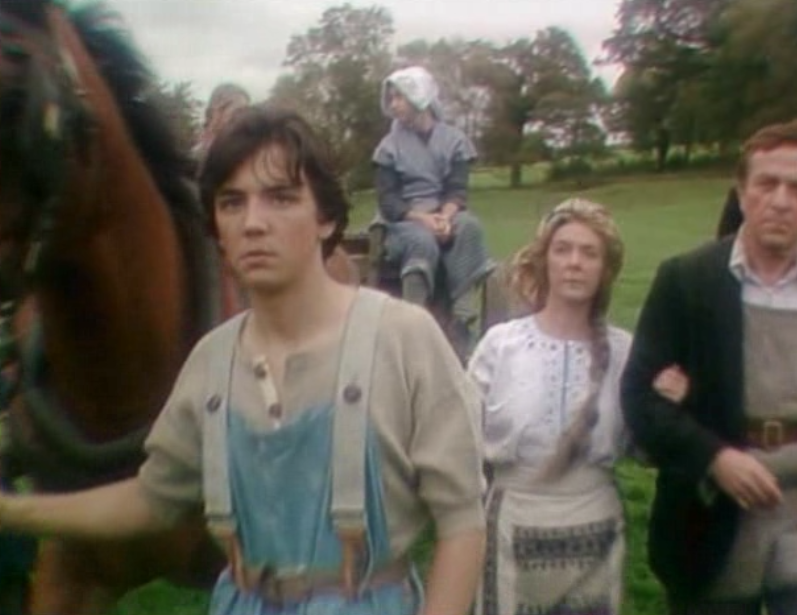 The juxtaposition of the words “A village in England: July, 2089 AD” and the primitive, somewhat pastoral, village setting we see right from the get-go sets up what I will be calling “The Reverse Shyamalan”- we have already seen the twist, let’s find out why it happened. We know that something isn’t right: either these people are some sort of Anabaptist off-shoot that hates technology, or something bad has happened in the past. This is answered almost immediately as we meet the main characters on their way to a village celebration. It seems that a neighborhood boy has reached the age at which everyone is considered an adult, and is to have his “capping ceremony”. Will and his cousin Henry are disturbed by this practice as everyone that gets “capped” comes back different. Capped individuals seem to lose any sort of creativity, drive, and imagination that made them who they were . “Adults” become bland worker drones that want no other past time than work and singing the praise of their “masters”. 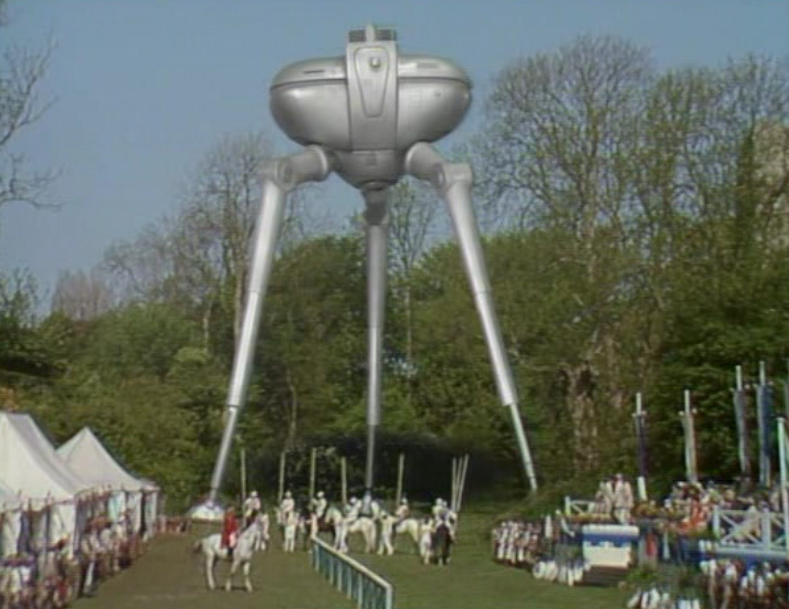 These masters are of course gigantic three legged monstrosities called “Tripods” and the Capping Ceremony can be surmised as a way of them controlling humans. At this point we have no idea what these creatures are or what they want with the human race, but one can see that it isn’t good. 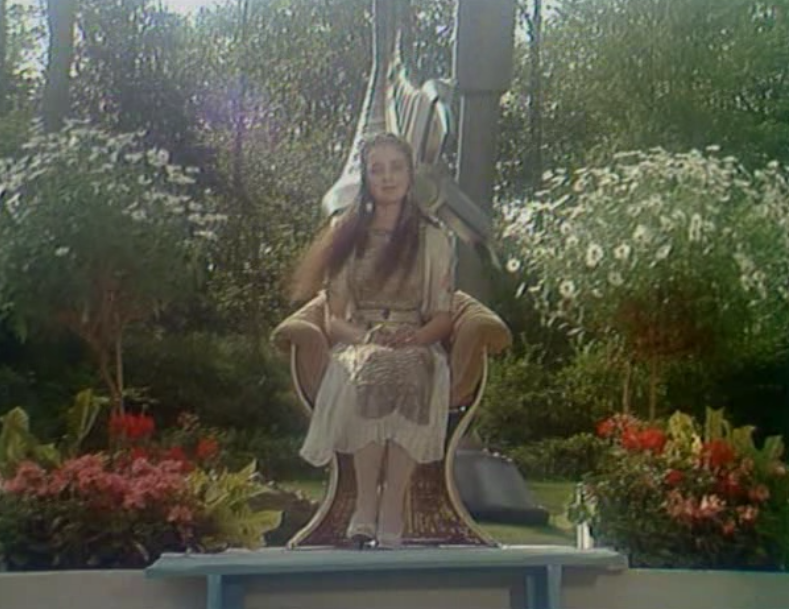 As with many BBC science fiction productions of the time, the special effects are dated to the eighties. 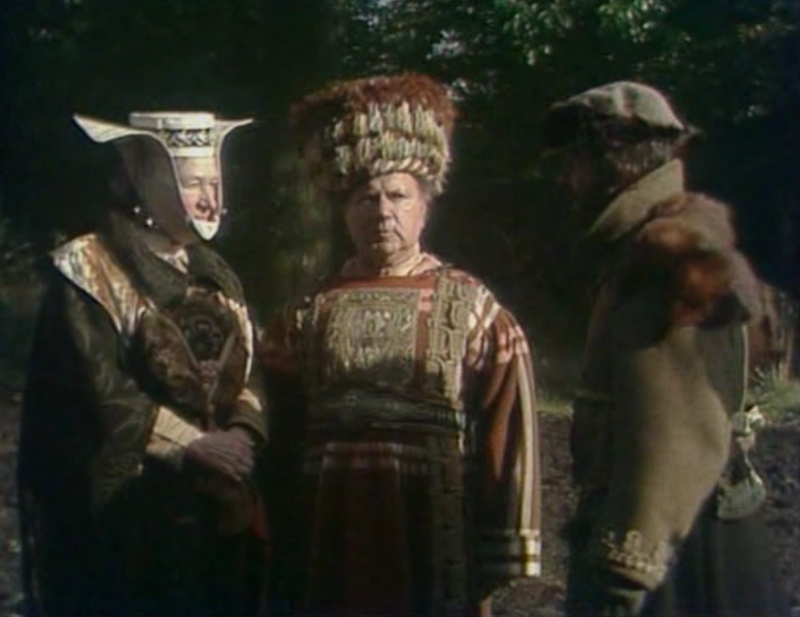 The hairstyles, clothes, and even set designs are very much reminiscent of other TV productions I have seen from the time. 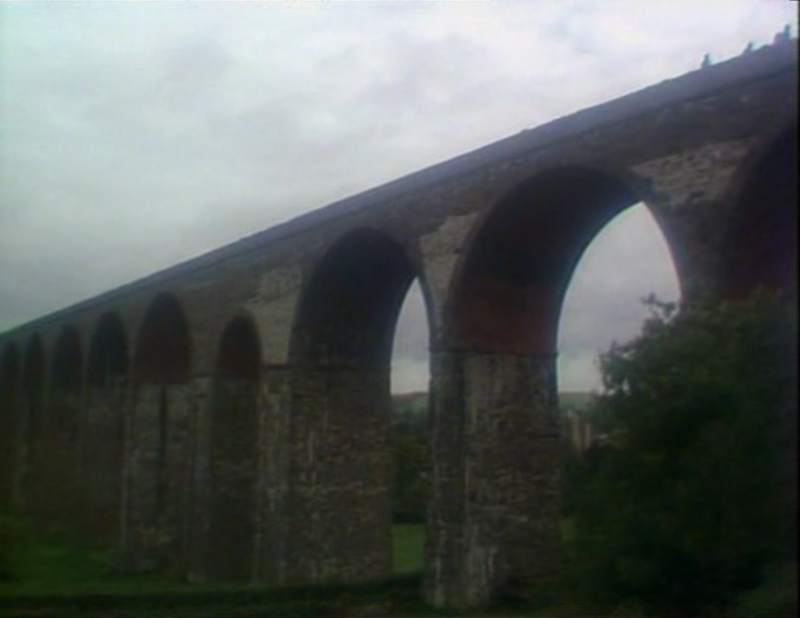 This show does appear to have a better budget than something like classic Doctor Who, in that there are location shots, outdoor scenes, and other evidence that the whole thing wasn’t just locked into a dark studio in an industrial park somewhere. The tripods themselves are done with miniatures and puppets; these look great to me and would have been poorly done had contemporary computer generated effects come into play. 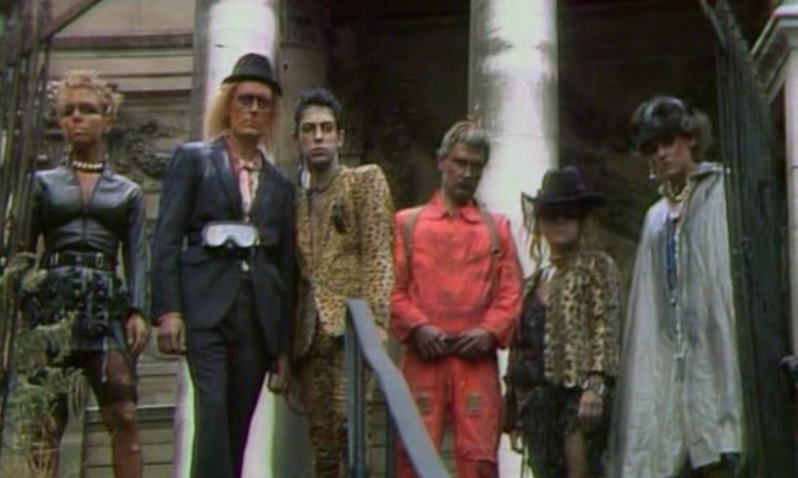 I sometimes look at late eighties Doctor Who and cringe at some of the special effects. For me this eighties vibe adds to the charm, and there really isn’t anything that makes it so dated that it’s hard to watch – something that is hard to say about a handful of older U.S. productions that haven’t held up. 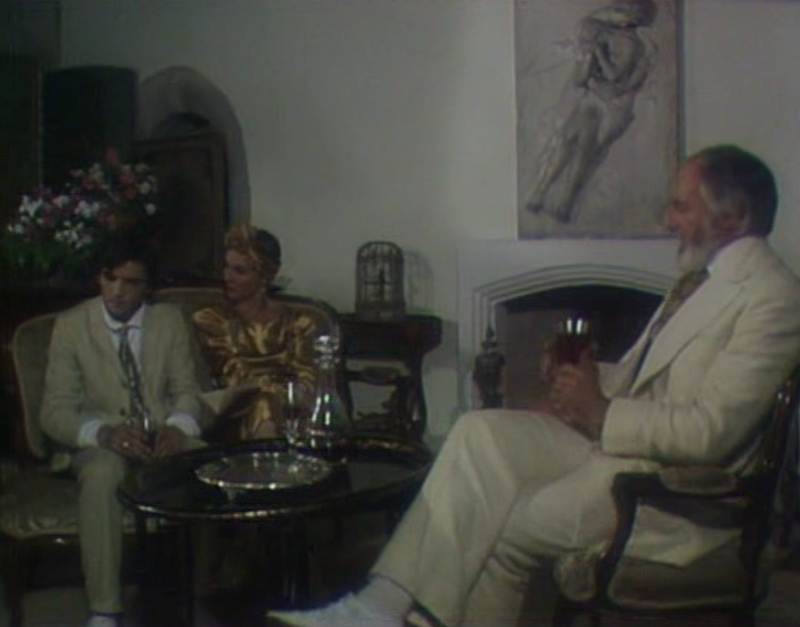 I recall renting the TV series to the landmark miniseries V, and barely making it through the season. I think a lot of it has to do with the fact that the boys are walking around in a post-apocalyptic world that had a vaguely referenced bad thing happen in the past. 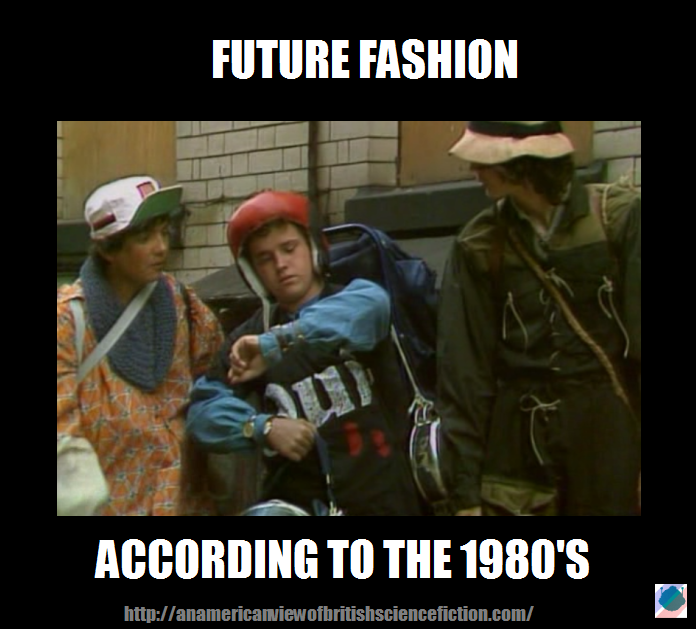 If you see them find some blatantly eighties clothes in an abandoned storefront, as we see in a later episode it makes sense because humanity has regressed to something like pre-industrialized England or a reasonable facsimile thereof. One thing that immediately caught me was the musical score as done by Ken Freeman. He is notable for being behind the synthesizer parts of the legendary rock opera version of The War of the Worlds by Jeff Wayne.Freeman did a great job of creating a solid synthesizer-based soundtrack for the series; one that is neither overpowering nor too minimalist. I always had problems with eighties shows being accompanied by either disco music (which immediately dates it) or music that sounds like a cat running across a piano to emphasize action. Here is a video of the opening theme to give you an idea of the kind of music I’m talking about. 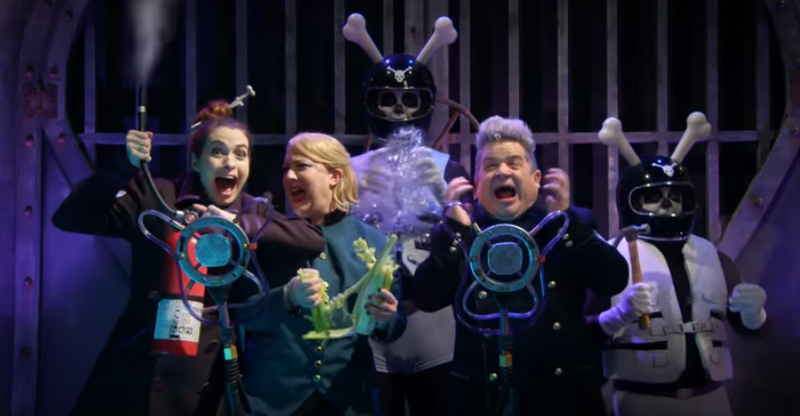 While the show hasn’t had as much exposure, I liken this to equally catchy and iconic theme songs such as The A-Team, Airworlf, and Doctor Who. 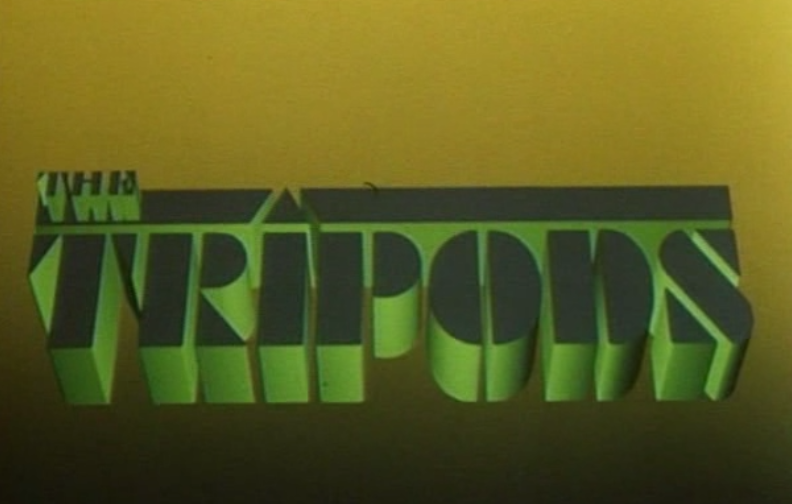 The Tripods is a solid show, and has captivated both my wife and I all this week. Perhaps it is my love for these sort of post-apocalyptic stories that has led me to such enjoyment, but I feel any science fiction fan should enjoy it unless they are adverse to seeing the eighties. 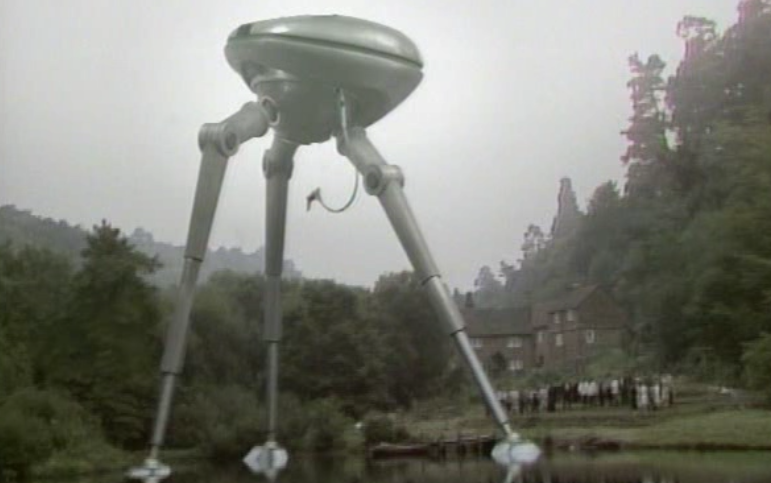 The Tripods is one of those shows that keeps you on the edge of your seat; whether it be the unraveling mystery of what happened before 2089, or the constant cliffhanger endings,I was always entertained.